St. Marco’s Campanile, the bell tower, is one of the most iconic symbols of the world with many replicas, including this one you see in the photo which was built for the Barcelona International Exposition in 1929. November 2014, single image, additional exposures for highlights and traffic trails, focal length 22mm, aperture f/11, shutter speed 6 seconds, ISO 100, tripod. The original St. Marco’s Campanile actually isn’t even in its original form. It isn’t just tourist Saint Marco’s Campanile attracts, but lightning struck it again and again throughout history. It’s been damaged by fire countless times, and the whole structure actually crumbled in 1902. Restorative efforts kept this relic alive until this day even though the campanile, in its original form, was built all the way back in the 14th century. 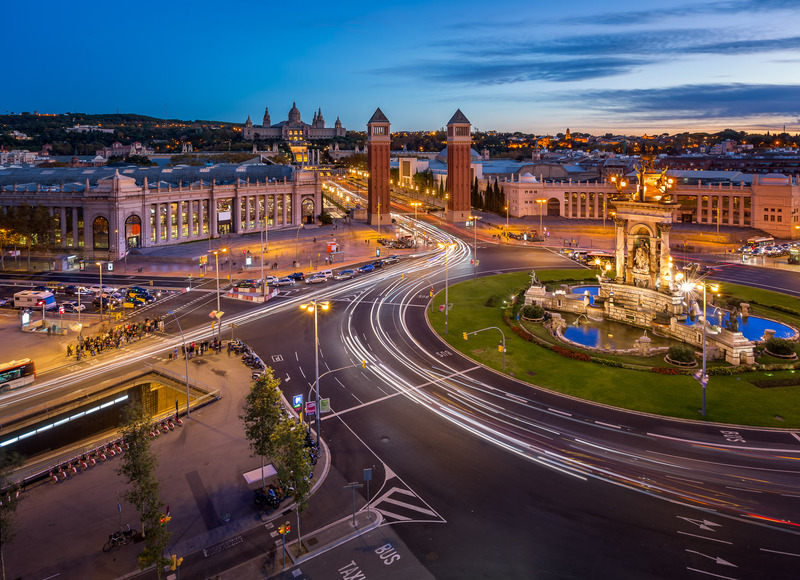 As a photographer, this is one of the most beautiful places in Barcelona with Placa Espanya, St. Marco’s Campanile, Montjuic Hill and the palace-like National Art Museum. Obviously I’m taking this photo from the former Corrida Arena which is now a shopping mall called Plaza de Toros – it was easy to convince my wife to visit it while I did this shoot! I spent a whole evening to shoot the aerial photo you see here. I’d planned long before to capture this composition, so it was exciting to finally see my plans come to fruition. It took me hundreds of photos to get the best sunset light and evening city lights play together. This entry was posted in City and tagged Barcelona, Spain.